HÀ NỘI — The Ministry of Industry and Trade (MoIT) will hold bids on the right to use duty quota to import 94,000 tonnes of sugar this year. The bidding will take place at 9am in the ministry’s meeting room on 23 Ngô Quyền Street, Hoàn Kiếm District, Hà Nội on September 26. The volume includes 65,000 tonnes of raw sugar and 29,000 tonnes of refined sugar. As per a ministry circular on managing the import tariff quota for sugar this year, bidders can include traders who supply sugar for food manufacturing and traders supplying raw sugar for the production of refined sugar, reported vov.vn. The reference price for raw and refined sugar is the same, at VNĐ1.4 million (US$60.9) per tonne. 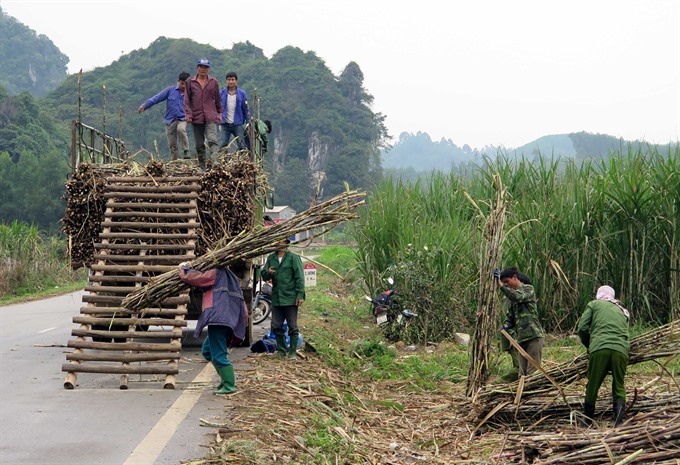 According to the Việt Nam Sugarcane and Sugar Association (VSSA), Việt Nam should import raw sugar as well as apply special safeguard measures to rescue the domestic sugar industry. In the 2017-18 crop, the domestic sugar industry produced 15.6 million tonnes of sugarcane and 1.47 million tonnes of sugar. Of which, refined sugar accounted for about 50 per cent of sugar output, said the association. The wholesale price of white sugar on the market at present stands at from VNĐ10,500 to VNĐ11,100 per kilo. This is the lowest price since January 2015. Meanwhile, sugar inventory is still over 620,000 tonnes. Some factories have not paid hundreds of billions of đồng for sugarcane farmers because they could not sell sugar products, it said. To reduce the difficulties for sugarcane and sugar enterprises, the association has proposed the State to permit importing 100 per cent raw sugar in the total of 94,000 tonnes of import quota of sugar for this year or 70 per cent raw sugar and 30 per cent refined sugar of the import quota. Previously, to save the sugar industry, the association also sent a proposal to Prime Minister Nguyễn Xuân Phúc on applying special safeguard measures for liquid sugar, reported dantri.com.vn. According to the association, to compete with imported sugar, on top of the sugar industry’s efforts, it is necessary for the Government to apply the preferential tax policy between sugarcane and sugar. As of July, sugar inventories at factories stood at about 700,000 tonnes. This was also after two years of low production. VSSA’s statistics show that the country now has 41 sugar mills with total designed capacity of 150,000 tonnes of sugarcane per day in 25 provinces. However, 22 of them have a capacity of less than 3,000 tonnes each. One of the 22 factories was closed since the end of 2017. The remaining 21 factories belong to companies with outdated equipment and technology, facing many difficulties during regional and global economic integration. According to the association, the ASEAN Free Trade Area (AFTA) effective January 1, 2018 would directly affect the 41 sugar factories, of which the 21 weak factories are likely to close due to losses.